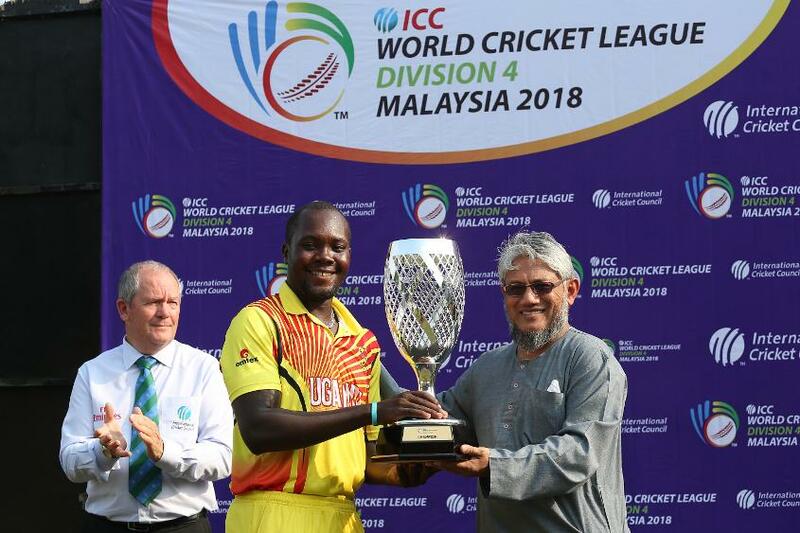 On another exciting final day’s play at an ICC World Cricket League tournament, this time Division 4 in Malaysia, both Uganda and Denmark secured qualification to Division 3. With Saturday’s matches being replayed today, all positions were up for grabs. At UKM Cricket Oval Uganda beat Jersey by seven runs to win Division 4 and secure a Division 3 spot. Whilst Denmark who weren’t playing, could only watch on, as they narrowly secured the second position by net-run-rate from Malaysia in third position who now remain in Division 4, alongside Jersey. Vanuatu and Bermuda are both relegated to Division 5, after finishing in fifth and sixth place respectively. There was a low scoring match at the UKM Cricket Oval between Uganda and Jersey, where a number of different permutations meant either teams, or Malaysia or Denmark could still qualify for Division 3 at the start of the day’s play. Jersey’s Ben Stevens would have felt he had to put his team in with an excellent chance after taking four wickets for 22 runs, but Uganda had other ideas. Uganda’s Charles Waiswa (34), Riazat Ali Shah (22) and Frank Nsubuga (13) were the only ones to get into double figures for the Ugandan batting line up, as they totaled 90 runs after being bowled out in 37 overs. Elliot Miles (2/9), Harrison Carlyon (2/18) and Charles Perchard (2/12) all took two wickets apiece. In reply, Jersey lost early wickets as Uganda put the pressure on the European team, with Player of the Tournament Ben Stevens bowled out by Frank Nsubuga (3/7) for 12 runs. With 11 runs needed for victory, Jersey were 80/6, but three wickets for Roger Mukasa swung victory to the African team. Anthony Hawkins – Kay who top scored with 24 runs was bowled by Mukasa, and the last three wickets fell for three runs as Cornelis Bodenstein (0), Charles Perchard (0) and Elliot Miles (0) all failed to score. Winning by seven runs, Uganda celebrated promotion to Division 3. 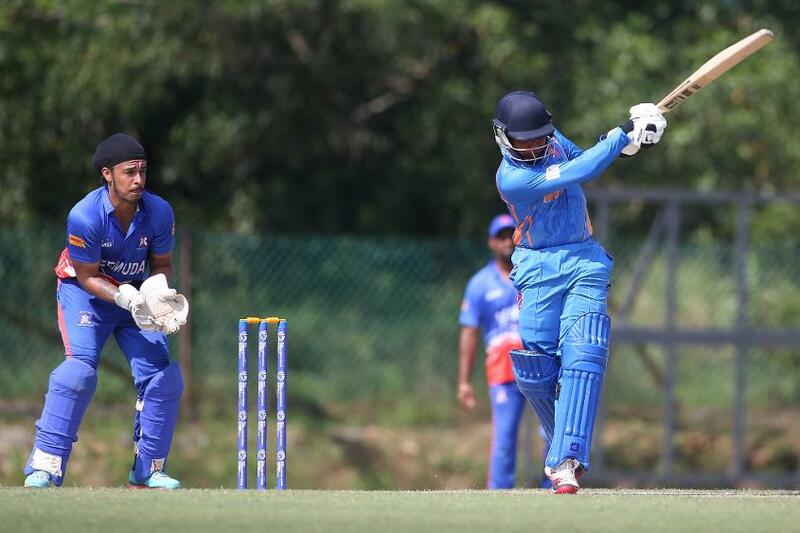 Malaysia who were also still in with a chance of qualification to Division 3, batting first did their chances no harm by scoring 257 runs for eight in their 50 overs. Anwar Arudin put in another captain’s innings in this tournament scoring 60 runs from 49 balls including three fours and four sixes. Syed Aziz (52) and Ahmed Faiz (50) also scored half-centuries for the hosts. Bermuda’s Chare Smith (3/42) and Janerio Tucker (3/34) took three wickets apiece. Malaysia knew they had to improve their net-run-rate to be in with a chance of taking one of the top two spots, and started off in the best possible way, taking early wickets as Bermuda were on 37 runs for six wickets after 15.4 overs. Muhammad Wafiq’s figures of three for 35, supported by Pavandeep Singh (2/17) and Muhamad Syahadat (2/41) put the Asian team in a great position. However, a partnership between Kamau Leverock (61, 111b, 2x4, 5x6) and Janerio Tucker (55, 81b, 3x4, 3x6), allowed Bermuda to reach a total of 168 runs for nine wickets in 50 overs, therefore sending Denmark to ICC World Cricket League Division 3 on net-run-rate.